Massive Open Online Courses are a great way for recent college grads to pursue lifelong learning. Image courtesy of @mathplourde. Looking for unique ways to add skills and complete classes to advance your career? Then consider completing a Massive Open Online Couse. Also known as a MOOC. 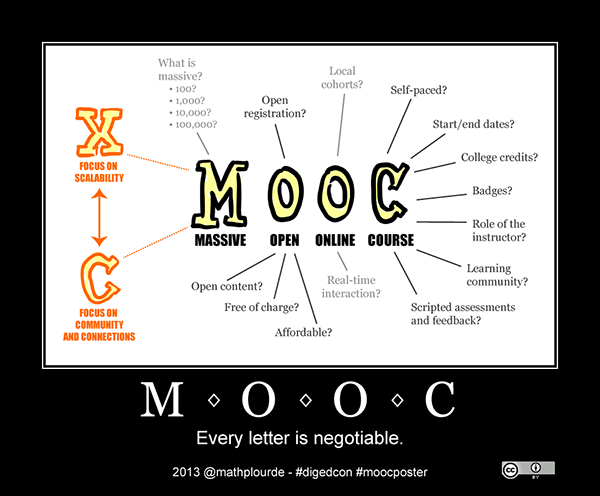 Why should recent college grad consider completing a Massive Open Online Courses? Because lifelong learning is essential to career success, and that’s exactly what Massive Open Online Courses provide. Through a MOOC, college students, recent college grads, and adult learners are able to take free classes to improve their foreign language skills, add additional tech/software skills, and/or learn about machine learning or artificial intelligence. Students can complete a MOOC to complement their current major or area of study, to learn how to start their own business, or to add critical skills to a resume. There is no limit to the course topic a MOOC can cover, and there is no limit to the location of the students completing a MOOC. As MOOCs evolve, the completion of these courses are becoming more respected by employers, and some MOOC programs offer, for a small fee, certifications and badges upon completion, which bolster the credibility of these courses. One Udemy student, Alexa, moved to New York after graduating to pursue her dream job of working in an art gallery, but had to take another job in the meantime to pay the bills. She took courses through Udemy to learn about marketing and transformed the job she thought she’d settled for into a different kind of opportunity she never knew she wanted. Here’s another example: Social media continues to transform industries, while the tools themselves continue to evolve. Social media careers are hot, and constantly evolving. According to Altimeter’s recent Social Business Survey, 41% of enterprise marketing teams say ‘social education and training to build new skills’ is a top priority. To meet this growing demand from employers, Hootsuite Academy offers online video-based training on social media skills and strategy at a great post-graduation price point: Free. “Even with a diploma in hand, graduates should never stop honing their skills,” says Cameron Ugernac, Senior Director of Community and Education, Hootsuite, a leading social media management platform. Posted in Advice for Candidates, Career Management, Choosing a Major, Choosing a Program, Internships, Job Search, On-line Education | Tagged Benefits of online learning, Cameron Ugernac Hootsuite, continuing education, entry level job seekers, Gelena Sachs Udemy, Hootsuite, Hootsuite Academy, massive open online courses, Matt Krumrie, Matt Krumrie College Recruiter, MOOC, MOOCs, online degrees, online education, recent college grads, soft skills, Udemy, What are Massive Open Online Courses?, What are MOOC?, What are MOOCs for recent college grads?